The truth is that your dog picked you. As much as you can argue that you picked him, when your eyes met his, the rest became history. Unfortunately, that doesn’t mean that your dog is a good traveler. We could sit here and name all of the breeds of dogs that do make good car companions (like a Pekingese or Basenji), but either you would already own one that isn’t on the list, or you would get one, only to end up with the exception to the rule. So, instead, we figured we should offer you some advice (from the ASPCA) for traveling with your dog: advice that should work with any dog breed. Yes, it is fun to drive with your dog on your lap. No, it is not safe. 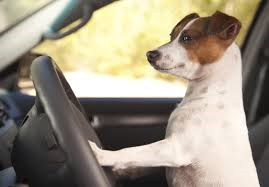 Even if you are super cautious and drive as defensively as you know how, your dog can make his way under your gas or brake pedal at the blink of an eye. Even if he stays put, he could get seriously hurt if you get in an accident. Instead, use a crate, car barrier, or seat belt to keep your dog secure. And remember, just like with kids, the backseat is the safest place for your pooch. If you thought your dog liked to run out of your door at home, just wait until you get him on the open road. Of course, you always want to keep him on a leash, but just in case he escapes your speedy hands, make sure he has a microchip or ID tag on before hitting the road. To keep your pooch entertained on the drive, make sure to bring his favorite chew toys, along with a spill-proof water bowl and his go-to food. Unfortunately, not all dogs are inborn with a love for car rides. Some get carsick, and some just plain don’t like it. For these dogs, it is important to get them acclimated to the car a little bit at a time. Start with having him eat a meal in the back of the car without ever leaving the driveway. Next, drive around the block. And so on, and so forth. Before long, your Fido will be begging to hop in the car with you.